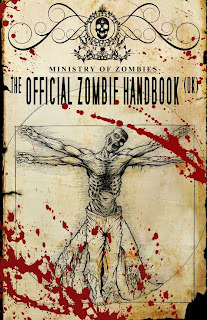 While written specifically to help people survive a zombie outbreak in the UK, THE OFFICIAL ZOMBIE HANDBOOK by Sean T. Page is a tome of international importance. The skills and tips found within can be used to help survivors of all nations, although it is interesting to read how some things differ when it comes to zombie outbreak in the US vs. the UK. Since pre-history, the living dead have been among us, with documented outbreaks from ancient Babylon and Rome right up to the present day. But what if we were to suffer a zombie apocalypse in the UK today? 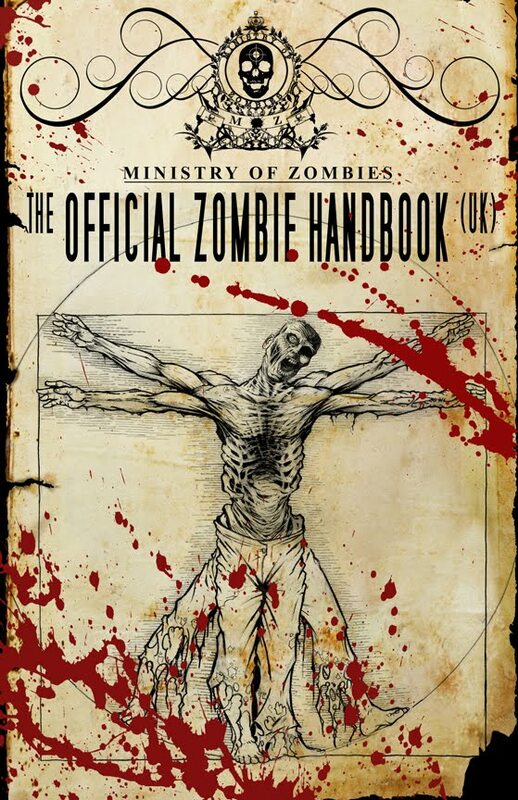 Through meticulous research and field work, The Official Zombie Handbook (UK) is the only guide you need to make it through a major zombie outbreak in the UK. This book contains everything you need to survive the upcoming zombie apocalypse. Inside you will find basic hints that anyone new to the realization of the upcoming outbreak can use all the way to more advanced tips that even the most trained zombie killer will find helpful. Hints include the types of weapons to use, the best places to hide out and set up camp in, and even gives charts to let you know the shelf life of most common canned foods. The book is broken into many parts and is explained very well in common terms which makes it very easy to read and understand. The book starts out giving you the basic definitions of a zombie and discusses all the different schools of thought on the causes of the zombie plague. Detailed case studies of previous isolated zombie attacks are discussed, from the first noted outbreak in the Roman Province of Atlas in 55AD to the most recent outbreak which occurred in Burma (Myanmar) in 1986. The book then goes on to discuss how the different defence forces in the UK would fare against the zombies, including the British Army, The Royal Navy, The Royal Air Force, and even the British Criminal Underworld! Very interesting stuff. While other books about surviving zombie outbreaks are out there, this is by far the most complete, comprehensive of them all, and it is a must have if planning on surviving the inevitable upcoming zombie apocalypse. We all know that when this plague of zombies hits, it’s going to hit hard. We also know that there is a good chance that it can go global. What we don’t know is when or where the first outbreak will occur. I and my ZombieMall.com website are based in the United States, that’s just by chance for me. I’ve got a plan for survival, as most of my readers should for their particular area. I took Max Brooks’ The Zombie Survival Guide and read it cover to cover. There were some things I already knew and a few things I learned. The topic of survival is always interesting to me, right on down to watching shows like The Colony and Survivor Man. I suppose my interest in them is because it shows survivor tools in various parts of the world. I’ll let that be a segway into a book I got in the mail this past weekend; The Official Zombie Handbook (UK) - A Ministry of Zombies book by Sean T. Page. While the book itself references many United Kingdom locations and terms, the information contained within is universal to getting prepared before, during, and after the plague hits. Please allow me to impress upon you that this book is not a rehash of Max Brooks’ book, not in any way. Sean T. Page goes into such detail and reflection that the line between fact and fiction does not seem to exist. Dude, it’s about freakin zombie survival! Of course you need it! Look, as I mentioned, yes, it references many United Kingdom locations, terms, and conditions, but the information overall is Universal. The Royal Navy may not exist where you live, but the topic of your water-going military’s evacuation plan is pertinent information, that topic in this book is insight you need to know! 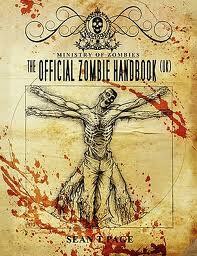 Listen, I got the Official Zombie Handbook (UK) on Saturday, within 2 days I had it read from cover to cover. That’s not to say it’s a fast read, I just tend to read fast. But here’s the cool part about this book: You don’t have to read it from beginning to end straight through. You can certainly pop open the book and pick a subject and begin reading (personally I love books like that). All in all I would have to say this book is a must have for any zombie enthusiast. You can find it on Amazon.com for further information you can visit the Ministry of Zombies Site as well. The only thing I can say about this one that is negative is that my site is not listed on page 188. Oh well, perhaps in the next Ministry of Zombies book, because, Sean, you gotta keep on writing my friend! Lastly, I just want to say to Sean, thanks for the read and.. I received this book as a gift, and, even though I am located in the states, I was very interested in this handbook by Sean Page. I mistakenly thought it would be a slightly different version of The Zombie Survival Guide by Max Brooks, but after reading through the whole thing, I was pleasantly surprised at the originality of Page's effort. As a result of the debates and discussions within the zombie community, the genre has been growing and evolving. However, the general public still remains unaware of the danger of potential outbreaks. Even though there have already been several guides/manuals written, most of the books do not contain practical guidelines that can be applied internationally. Sean Page, the author, has taken it upon himself to write such a manual specifically for the UK, where it is nearly impossible to get your hands on a firearm for self-defense. He also points out that preparing for a zombie outbreak with his 90-day survival plan would appeal to the environmentally-conscientious with a "green" agenda (for example, self-sufficiency); as most zombiephiles know, if you're prepared for an apocalypse, you'll be prepared for any emergency. Addressing the controversy over the various types zombies within the horror genre, Page defines a zombie as "a dead body that has been brought back to life by an as yet unidentified virus which leads to the body to behave in a low intelligent and cannibalistic way." He emphasizes that the cause of an outbreak is not as important as keeping yourself alive. Beginning with the history of zombies and corresponding research, Page provides basic background information for those not already familiar with the field of "zombiology," and walks readers through the science of zombie infection and transformation. The UK guide quickly moves onto defense and disposal issues for varying levels of outbreaks, going so far as to address the concern that a zombie virus could spread from humans to animals. Readers are made aware of the tactical differences between land and water locations, while Page lays out the blueprint for his country's national defense. He describes the complications that could arise if the UK government attempted a cover-up, illustrating this with a case study of one such incidence. The most crucial section of this manual is Complete Zombie Defence (sic), which examines the barricades, provisions and skills required for a group's survival. It tackles the who, what, why and how of the three main phases of the 90-day plan, taking lessons from past historical disasters, both man-made and natural, and including survivors with disabilities. There are a few diagrams, as well as a map of the UK, and critical details of every possible scenario are provided. I highly recommend this book to add to any collection of zombie literature! I’ll tell you something. If there ever were to be a zombie uprising, this is THE book I’d want on hand. In The Official Zombie Handbook, Sean Page covers everything from historical zombie attacks to what a person can do to fortify their homes once the dead have risen. Page is in the UK and that’s the focus of this book. Thus, there is little information on firearms. But a wide range of melee weapons are discussed, each rated on a uniform system as to how effective they will be against the undead. Obviously, the book is written somewhat tongue in cheek. However, what Page has done here is write quite an effective survival manual, with information and tips applicable to a wide range of disasters. I particularly liked the sections on home fortification, as that is something often overlooked in most end of the world survival books. Page covers all manner of preparations — food, water, transportation, medical needs, even reviewing various public and semi-public locations for places to go for shelter. Everything is discussed in a matter-of-fact form, yet very entertaining. Honestly, I enjoyed the heck out of this book. It was a lot of fun and chock full of great information. The only downside was, being written by a Brit, there is a fair amount of terminology and slang with which I, living in the US, am not familiar. All in all, if you have a horror fan on your gift list, or if your a fan yourself, pick up a copy of The Official Zombie Handbook. Fun reading and well worth the cover price.